Yesterday I decided to dig through my closet to see if I could find a cafe curtain for the bottom half of my kitchen window. I’m doing all I can to help keep the heat out and the cooling in. I came across this red and white striped curtain I sewed years ago. This curtain was the only one that was the size I needed. I hesitated about mixing the red and white Buffalo check on top and stripes on the bottom. But then I thought, well why not? I’ve gotten to the point in my life that I make my own decorating rules and try to use what I have instead of always buying something new. Saves money and effort. Charlie and I go outside and roam around the patio every few hours. He sniffs around and I check out the plants and dead head the petunias and daisies. I have never allowed the pupsters to go outside without watching them. I either stand at the window or go outside. Spring did not last long here. Maybe a week or so. Then it went straight to hot weather. So it isn’t that pleasant to be out there by the end of the day. I have a few peppers. I cannot recall what variety of peppers or cucumbers I bought a month ago, so I’m not sure when they’re ready to pick. I should have kept that info. Take a look at these cucumbers. It’s hard to get a good photo of them. My whole patio is just so lush and colorful. Every pot has pretty much filled up. Boy, was that fast. Lemon balm is even growing up through a cement crack. I’ll have to take a photo of that to show you. I switched up a few things on my blue cupboard in the dining space. When I put the bottom curtain up in the kitchen window there wasn’t much room left for the vintage mason jars on the window sill, so I moved them here. Last night I was reading in bed and Charlie was dozing when we heard something at the window. So we went to check it out. Over on the fence I saw a little Bewick wren. The ones with the white “eye brow.” I figured they’d been trying to fly and hit the window. Every year around this time the clumsy little babies are in flight training. I hope to get a photo of one of them. I don’t know where the nest is. Life is not normal here at my home. But things are starting to normalize, if that makes any sense. It is still a bit surreal. We have lost a beloved member of our family and Abi is so terribly missed. But Charlie and I are comforting one other. And he is staying close by my side. I love the curtains with the mix of fabrics. It looks great! You have a great eye for decor. I love the curtains…. the mix of patterns look great!! Glad that you and Charlie are trying to move forward and enjoy one another ……. one day at the time…. this is a wonderful heart quickening post! i love the kitchen window. and the picture of Charlie. 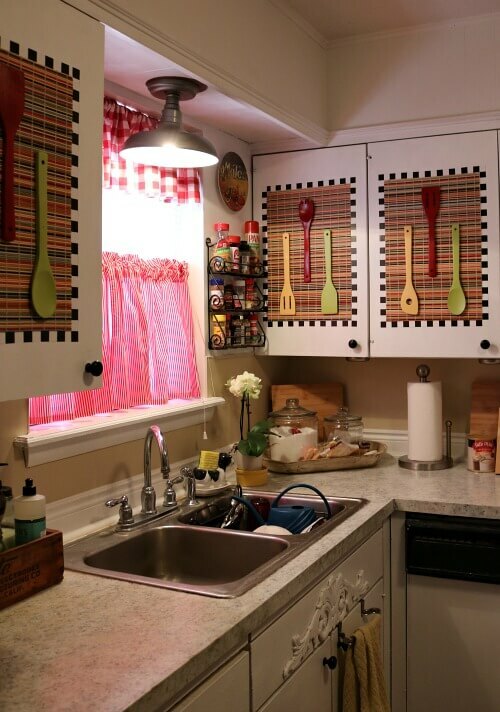 I love the mixed prints for your kitchen window! Very pretty! I’m glad you and Charlie are comforting each other. The curtains are pretty! I like the mix. I had been thinking of you and whether changing up something might take your mind off things for a bit. Charlie looks good. I love the curtains & especially in red. Your garden amazes me with how much it has grown already. You & Charlie are in my thoughts. Your kitchen curtains look wonderful, they are the same color, I love the two different patterns together. Glad that Charlie is on the mend. It will take a while to get back to ‘normal’ and sometimes we just don’t want to go back there anyway. Much love to both of you..
Lovely curtains Brenda. I am also for using what I have before shopping for the new. I am very glad to see you are making progress to being back to a new normal.. Also glad to hear Charlie is a comfort as the two of you make it a new normal. Blessings to you and Charlie. I love the curtains. I never would have thought to mix patterns. Looks nice. Red is my favorite color and I absolutely love the mix of checks and stripes at your kitchen window. It is charming. I completely understand how very much you miss your Abi and how things just are not normal. There is no way to make it feel so right now, but you are doing well to do the things you are doing. Continue to take extra care of yourself. I know you are talking special care of Charlie as you always have. I agree. The mix/match curtains look great. I really like them. I’m glad that things are getting a little bit better each day for you and Charlie. Your patio is really filling out I love all of it. I’m just starting to get some plants. It’s been too cool here to start any sooner. Love the mixed patterns. It looks like you did it on purpose. Here in NC, we have not really had a spring either so I understand going from winter to summer. I’m glad I have everything planted before it is just unbearabe to be outside but there are other things I want done (purge and clean out the shed) and the sudden heat will not make it easy. I’m glad you and Charlie are nurturing each other. I like your curtains. Good for you, being so resourceful. I think the mix of patterns is very cute! Same color family, so you can’t go wrong, in my book. Our weather on the high desert has just got to where it isn’t freezing or below at night, so I’m just starting to plant. It’s such a very short growing season, but I give it a good try! I’m glad Charlie is feeling better. I’m glad you are gardening. It will help a little to soothe your soul. 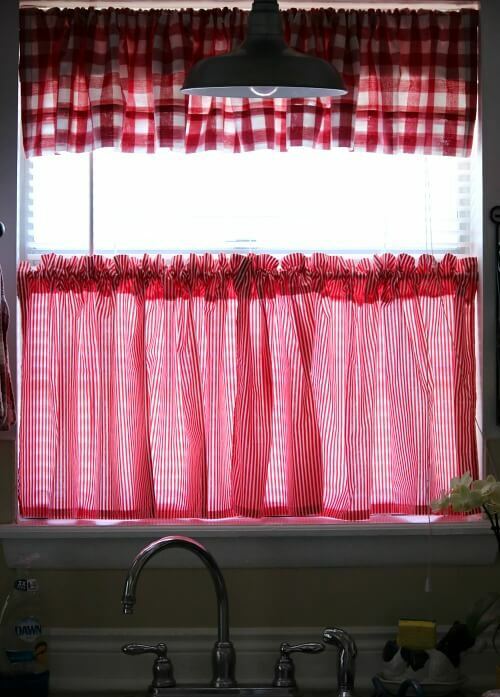 Love the look of the buffalo check and stripes cafe curtains on your kitchen window. I mix patterns – it’s your house, do what you like! My bed is covered in an old Ikea duvet cover in a dark grey and “white” floral pattern, I have black and white gingham checked sheets pillow cases and my pillow covers for the back “decorative” pillows are a black and “white” large paisley print with large floppy flanges. It works for me 🙂 Your home looks beautiful and comfy, well organized and arranged. I don’t think most of us are comfortable living in a magazine cover – you know, sooooo perfect you are afraid to sit down or touch anything. I love the mix of patterns! A happy thing for sure. I think everyone jumps to replace things to fast in this day and age anyway. I try to make things last and if I do replace try to find bargains. I’m glad you and Charlie have each other. We went from cool to HOT overnight it seems! I think the kitchen curtains look great together! I occasionally dress a little outside-the-box too. I have a very vibrant pair of flowered capris that I wear with a gingham blouse. The aqua in both are a perfect match. I hesitated for a long time but it makes me smile now that I do it. Surreal is a completely appropriate way to describe your and Charlie’s lives right now. The thought that comforted me the most in those early days was that my Maci was no longer suffering. It brought me peace. The curtains look stylish mixing the designs. The color makes it look like they came that way. I love that picture of Charlie! It takes time to get into the swing of a new normal. It will help you both that you are sticking close together. You have lots of love and support from all of your friends here in blogland. I like this it looks great. Happy Friday. Have a good weekend. I like your curtains very much – they do look as if they could be a set! Good for you, re-using is such a smart way to go. And happy to find a tone of more peace in your loss of little Abi – I’ve been there too, Day by day. The garden is just beautiful! 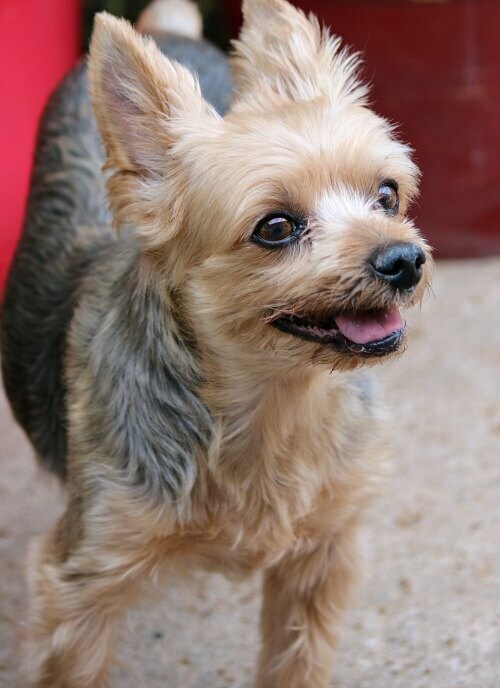 And the pic of Charlie is so sweet. Wow! 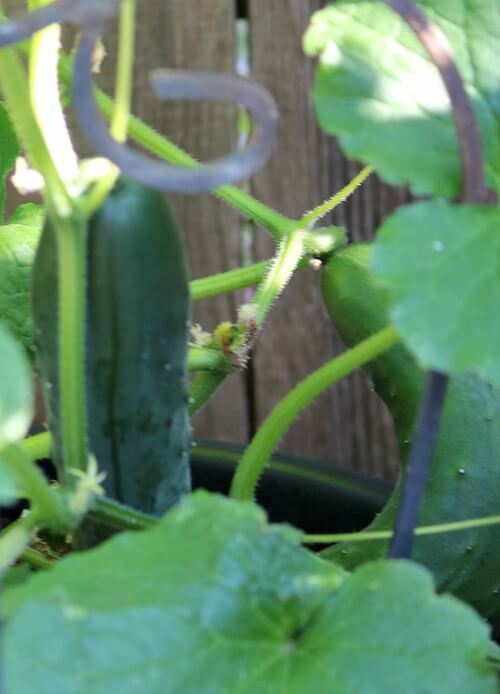 That cucumber looks ready for the table! It is amazing to watch your garden grow and it does seem like those flowers, herbs, and veggies are on steriods. The curtains look so good — love the checks and the stripes together. And it is so much fun to rummage through your “old” things and make them new again. So nice to know that Charlie is taking care of you and you are taking care of Charlie. Just seems like the way it should be! I love your curtains! I am glad you have your patio garden. It is so beautiful and gardening is very calming and soothing to the soul. I am very happy that Charlie seems to be improving. Still thinking and praying for you two every day as you are finding your new normal. The curtains look great. Warming up here, but our frost free date is June 10. Green houses are stocking plants, but I have played the cover up game too many times to take a chance. Daffs and tulip time now..
Glad you are finding solace in Charlie’s company. There will come a time when you think of sweet Abi and smile as you remember her special traits that made you love her. Until then, know that we all are thinking of you and are so sorry for your loss. Grieving is a very slow process,when Bill died,I’d call it a good day if my pillow was dry when I woke up or if I could look at something around me that reminded me and not sob for hours. Let your mind and heart guide you and Charlie through this,the day will come when her memory brings a smile in place of a year and you’ll know that the healing has begun. I’m so glad to have read this perfect post, Brenda. 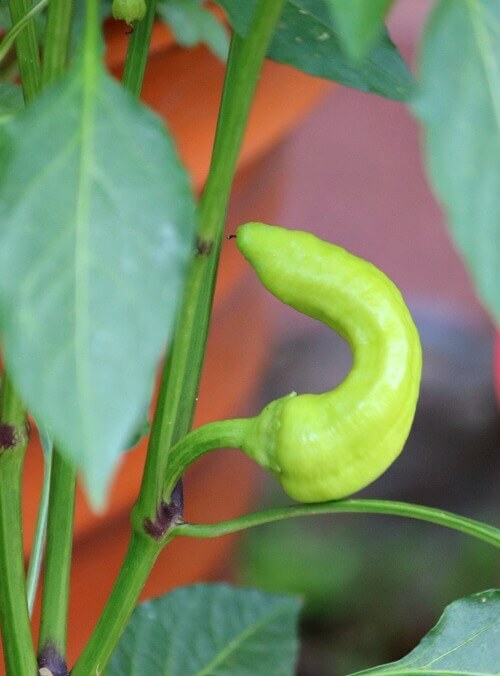 Little Charlie is “looking good”, and so is your garden. 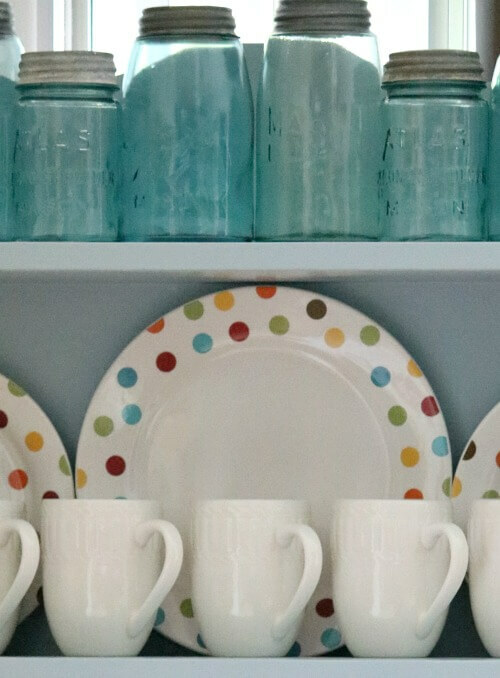 I also like your curtains, and I think the blue jars look wonderful on your dining room cupboard! Wishing you a peaceful weekend. -Your kitchen window looks sooo pretty! (and you are probably on-trend.) I love Charlie’s little happy smile. You are wonderful, Brenda and you and Charlie are strong. So glad to see you are taking an interest in your apartment and your garden. I know it must be difficult but remember, baby steps. Even if you take 2 steps forward and one backward, you have made progress. Keep it up; your readers love you. Brenda, the new curtain looks great! I cannot believe how big your cucumbers are already. I am sure they will taste delicious. Charlie looks good, I hope he is feeling better. I hope that you are feeling a little better. Just take on day at a time. Have a nice weekend try to stay cool and enjoy your beautiful garden. Isn’t it interesting that Charlie seems to understand that staying close to you is a comfort to you and him as well. He knows that it’s just the two of you now and that sticking close is very important. I can’t imagine what goes on in his doggy mind regarding Abi not being there. I really think animals know and understand so much more than we are aware of. I believe they grieve in their own way, too. Bless the both of you as you navigate this new terrain. Brenda, I love the new kitchen curtains and I think they are way more interesting not matching than if they were both checked of both striped. They look like a nice, hopefully, functional change. We are pretty much into the hot weather here, too. Unfortunately, my flower beds and planters haven’t even been planted yet. Today was the first day I have felt well enough with this nasty sinus infection, to go out to buy some flowers with my daughter. I felt well enough to dig out some weeds in my shade garden yesterday and want to plant petunias and impatiens tomorrow if it’s not raining, which it might, according to the weather predictions. Give Charlie some pats from me and hugs for yourself. Take care. speaks volumes as to the heart within you and your desire to take steps toward emotional healing. I am thankful as so many others that you have Charlie to love and to accept the comfort he can return to you. Day by day I pray the loss of Abbie lessens until you can think of her and find that her memory brings not tears, but a smile. Stay strong…you encourage us all by your example. I like the mix of Buffalo check and stripes. Love the red too. This photo of Charlie is so good. Love that fuzzy face. Glad you are doing a bit better. Hope your gardening brings you some solace with the loss of your baby girl. You are an inspirational lady and give us all a great philosophy to follow … make do, use it up or do without ! My grandmother’s favorite saying. Good Morning Brenda! You and Charlie just take as much time as you need for healing. I do love your mix up of curtains. I mix fabric up like that too. I like it better than everything matching.. I can’t believe how big your veggie are already. We are just being able to plant our things. Hopefully will finish up planting flowers next week. Treat yourself special and have a wonderful week end. Stripes and buffalo checks will now be the fad! Your kitchen red curtains look good together and you’re right, anything to keep the heat from coming in, with Summer greeting us already. Love the curtains! Great idea to help keep heat out!